Partner to 70294E, this carriage is a tender vehicle for Travelling Post Office trains. It was used for the storage of mail bags and would have beencoupled to a sorting carriage - exactly as it still is today on the GCR. 70268 has an interesting history having originally been built as a pigeon van no.6777 in 1931. It ran in its original form until 1950 when it was unusually selected for rebuilding as a post office tender. It was therefore rebuilt with offset gangways and, even more bizzarely, had its Gresley bogies swopped for ones of a Great Eastern design. It operated in this form on the East Anglian main line and would have made its acquaintance with 70294 at this time. Withdrawn in 1968 (by then painted rail blue), it was preserved by RVP in 1973 and went to Chappel. 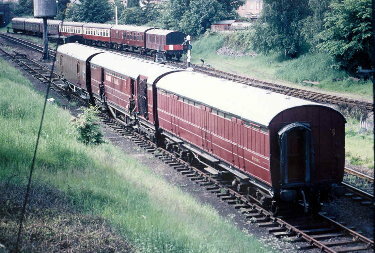 Restored externally in maroon livery in re-entered service on the GCR in 1982 and has been running ever since. Interior restoration followed in 1993, and it was fitted out with an impressive museum of postal history. Like 70294E it is no longer used for mail exchange trains, but remains available for static display and moves around the GCR for such use.